For other ships with the same name, see USS New York. Motto: "Strength forged through sacrifice. Never forget." two Rolling Airframe Missile launchers, fore and aft. USS New York (LPD-21) is a San Antonio-class amphibious transport dock and the fifth ship of the United States Navy to be named after the state of New York. Shortly after 11 September 2001, Governor of New York George E. Pataki wrote a letter to Secretary of the Navy Gordon R. England requesting that the Navy bestow the name "New York" on a surface warship involved in the Global War on Terrorism in honor of the victims of the September 11 attacks. In his letter, the Governor said he understood state names were reserved for submarines but asked for special consideration so the name could be given to a surface ship. The request was approved on 28 August 2002. On 9 September 2004 Gordon R. England, then the Deputy Secretary of Defense, announced that two of New York's sister ships would be named Arlington and Somerset in commemoration of the places where two of the other planes used in the attack came down: Arlington County, Virginia, and Somerset County, Pennsylvania. Steel from the World Trade Center is melted and poured for construction of New York, September 2003. A symbolic amount of steel salvaged from the World Trade Center after it was destroyed in the September 11 attacks was used in her construction. The ship is the first to be designed fully from the CAD-screen up to support all of the Marines' primary mobility capabilities—Landing Craft Air Cushion and MV-22B Osprey. The contract to build New York was awarded to Northrop Grumman Ship Systems of New Orleans, Louisiana, in 2003. New York was under construction in New Orleans at the time of Hurricane Katrina in 2005. 7.5 short tons (6.8 t) of the steel used in the ship's construction came from the rubble of the World Trade Center; this represents less than one thousandth of the total weight of the ship. The steel was melted down at Amite Foundry and Machine in Amite, Louisiana, to cast the ship's bow section. It was poured into the molds on 9 September 2003, with 7 short tons (6.4 t) cast to form the ship's "stem bar"—part of the ship's bow. The foundry workers reportedly treated it with "reverence usually accorded to religious relics," gently touching it as they walked by. One worker delayed his retirement after 40 years of working to be part of the project. New York was christened on 1 March 2008, in a ceremony at Avondale Shipyard in New Orleans. Dotty England, the ship's sponsor, smashed the traditional champagne bottle on the ship's bow and christened the ship New York. Several dignitaries were in attendance, including Louisiana Congressman William J. Jefferson, Deputy Defense Secretary Gordon R. England, members of the New York City Police Department and the New York City Fire Department, and family members of 11 September victims. The champagne bottle did not break the first time it was struck against the hull of the ship, but the second attempt was successful. The ship was delivered to the Navy on 21 August 2009 at New Orleans. She set sail for Norfolk, Virginia, on 13 October 2009. On 2 November 2009 the ship passed the World Trade Center site for the first time and gave the site a 21-gun salute. The ship commissioning of USS New York took place on 7 November 2009, in New York City. Speakers included Secretary of State Hillary Clinton, Secretary of the Navy Ray Mabus, Gov. David Paterson, Mayor Michael Bloomberg, Chief of Naval Operations Admiral Gary Roughead, and Commandant of the Marine Corps General James T. Conway. Approximately one in seven of the plank owners are from New York state, a larger number than usual. 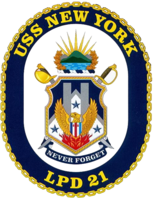 USS New York uses four Fairbanks-Morse license-built MAN Colt-Pielstick PC2.5 STC sequentially turbocharged marine diesel engines with inboard rotating Rolls-Royce controllable-pitch propellers. The V16-cylinder Colt-Pielstick PC2.5 STC engine is intended for use on ships requiring high propulsion power combined with a lightweight installation. Each V16 PC2.5 STC diesel engine weighs 84 metric tons (92.6 US short tons) dry without flywheel. This engine was selected to power all of the San Antonio-class vessels. Four engines are installed per ship, two per reduction gear, with each shaft having 20,800 shp driving its own controllable-pitch propeller. Each engine is rated at 7755 kW (10,400 hp) at 520 rpm, for a total of 41,600 shp per ship. On 11 January 2010, the Navy announced that the ship would have to undergo repairs for faulty engine parts after inspectors discovered the "premature failure" of bearings on the ship's main propulsion diesel engines during a week-long sea trial following the November commissioning. On 10 June 2012 the ship was deployed for the first time to the Strait of Hormuz and the Persian Gulf region. She deployed with Marines from 1st Battalion, 2nd Marine Regiment, 2nd Marine Division and returned in December 2012 along with the USS Iwo Jima and the USS Gunston Hall with Marines from the same unit attached to all three ships. In late 2013, the New York shifted homeport from Norfolk to Naval Station Mayport in Florida, as part of the Iwo Jima ARG move. In June 2014, the ship was used to transport Ahmed Abu Khattala, suspected mastermind of the 2012 Benghazi attack on the American diplomatic mission at Benghazi, back to the United States. In September 2017, the New York arrived off the Florida coast for Hurricane Irma relief, 16 years to the day after the 9/11/2001 terrorist attacks. Commissioning ceremony in New York. Steel from the World Trade Center is displayed aboard the ship. New York arrives at its homeport of Naval Station Norfolk pm 18 November 2009. USS New York docked at the North Carolina State Port in Morehead City, NC. Passing by New York Passenger Ship Terminal (Pier 86) during the Inauguration of Fleet Week on Memorial Day 2011. ^ a b c "USS New York (LPD 21): A Brief History". United States Navy. Retrieved 25 July 2016. USS New York (LPD 21) is the fifth U.S. ship to be named for the state of New York. ^ a b "Navy Secretary Assigns New Ship Name New York" (Press release). Navy News Service. 10 September 2002. NNS020910-10. Retrieved 25 July 2016. "USS New York will play an important role in our Navy's future and will be a fitting tribute to the people of the Empire State," England said. ^ a b c d e f "USS New York (LPD 21)". Naval Vessel Register. Retrieved 25 July 2016. ^ Deepti Hajela (2 November 2009). "Ship Built With WTC Steel Comes to Namesake City". Associated Press. Retrieved 2 November 2009. ^ Paisley, Pinch (1 March 2008). "USS New York Christened". Defense Tech. Military Advantage. Retrieved 4 May 2010. ^ Staff writer (4 April 2007). "Navy Ship with WTC Steel Survived Katrina's Assault". The Associated Press via St. Petersburg Times. Retrieved 2 November 2009. ^ "USS New York (LPD 21) | The Official Website. Commissioning Event Information". Ussny.org. Retrieved 28 October 2016. ^ Baldwin, Tom (22 May 2005). "Warship Built Out of Twin Towers Wreckage", The Times. Retrieved 2 November 2009. ^ "USS New York to stop in Norfolk". ussnewyork.com. 20 October 2009. Archived from the original on 6 November 2009. ^ Graham, MC1 Shawn D. (14 October 2009). "USS New York Departs the Banks of the Mississippi". Headquarters Marine Corps. United States Marine Corps. Retrieved 15 October 2009. ^ Navy To Commission Amphibious Transport Dock Ship New York, U.S. Department of Defense, Office of the Assistant Secretary of Defense (Public Affairs) News Release, 4 November 2009. ^ BBC News (11 February 2009). "'Twin Towers' warship enters NY". BBC News. Retrieved: 2 November 2009. ^ a b "History: USS NEW YORK, LPD 21". USCarriers.net. 13 November 2015. Retrieved 25 July 2016. ^ "U.S. FIFTH FLEET AREA OF OPERATIONS". US Navy. Archived from the original on 4 March 2013. Retrieved 11 December 2012. ^ BURGESS, RICHARD R. (30 October 2013). "LPD New York Shifts to Mayport in December". SEAPOWER Magazine. Archived from the original on 2 November 2013. Retrieved 30 October 2013. ^ Schmidt, Michael S.; Schmitt, Eric (29 June 2014). "Libyan suspected in Benghazi mission attack arrives in Washington". New York Times. p. A4. Retrieved 25 July 2016. ^ "Irma's trail of destruction in Florida Keys revealed". Fox News. 11 September 2017. Retrieved 11 September 2017. Wikimedia Commons has media related to USS New York (LPD-21). This page was last edited on 19 February 2019, at 03:10 (UTC).